Philippe The Original French Dip Sandwich, L.A. 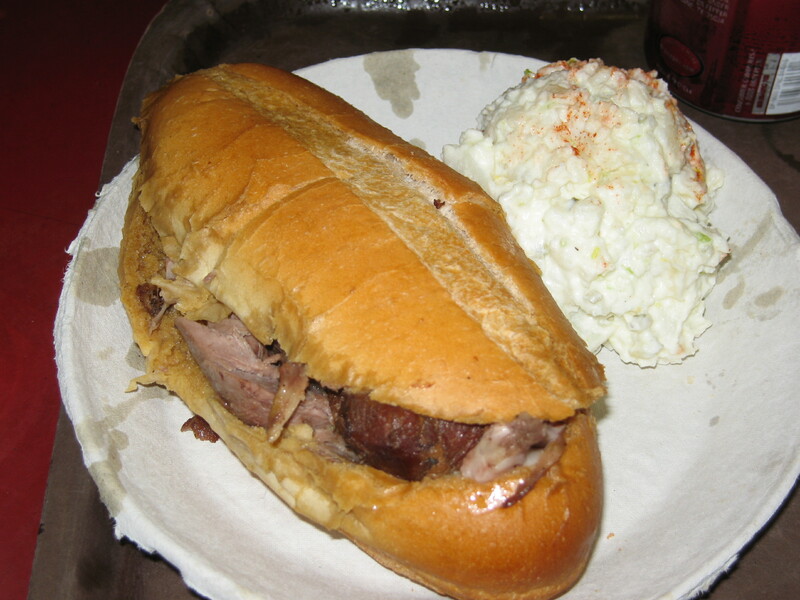 The Best French Dip Sandwich is the Lamb Dip Sandwich. The beef and pork are good, but there is really nothing quite like the tenderness and flavor of the lamb dip sandwich. Be sure to slather a little of the notorious, house-made mustard on the sandwich. For folks who like hot food, it’s a fire-starter if used in the proper proportions. As sides, the potato salad’s quite good. There are lots of things on the menu, from old-school, hearty soups (navy bean, split pea) to pickled beets, eggs, and pigs’ feet, but most guys usually just barrel down on 2 or 3 sandwiches. The Vibe: Really this ranks as one of my favorite places to eat of all time, for so many reasons. It’s over a century old and used to be the caterer when giant circuses came to town. It’s just a couple short blocks to Union Station and was the prime feeding ground for anyone riding the rails. it’s got the same vibe from a century ago: ancient booths and communal tables and bolted-down stools, sawdust strewn old flooring. And, during the decade or so I would occasion its giant hall in LA, it looks like most of the servers are the same, too. Phillipe The Original is one of the few restaurants in L.A. that has the everyman feeling about it, that survived the times when just past Beverly Hills were orange groves and Malibu was barely heard of; a place that, for me, hearkens back to the Depression through the film noir era. Seems like a joint that a mug who’s down on his luck might scrape up enough for a bite.